As Brazil advanced in its 2014 World Cup, protests from angry Brazilians over the Cup's incredible cost to the nation gave way to a feverish fandom — well, right up until Tuesday, when Brazil was absolutely trounced by Germany 7-1, breaking all kinds of records along the way. 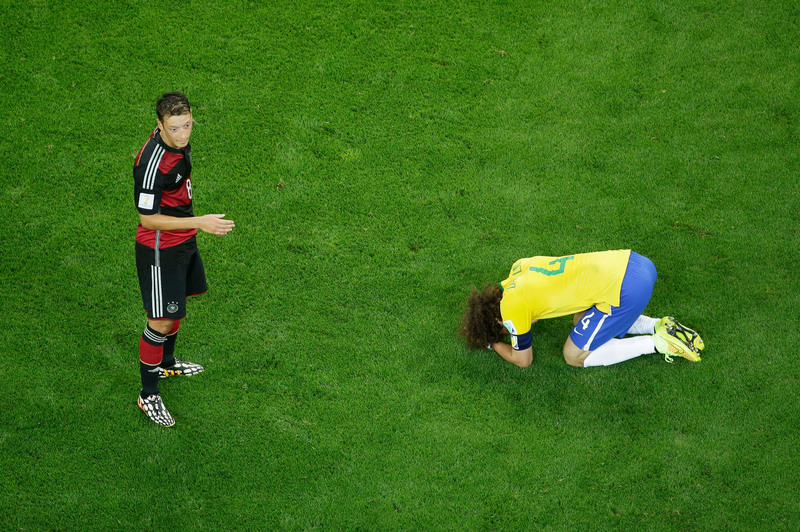 That loss led to a tearful post-game apology from Brazil's David Luiz, who could barely get his words out as he told Brazil the team was sorry for disappointing them. There are people who suffer so much here in Brazil. I only wanted to see my people smile, to see Brazilians happy because of soccer at least. We couldn’t do it. Everyone knows how important it was. We apologize to the Brazilian people worldwide and Brazil. Who is responsible when the team plays? Who is invited as the coach? Who is the coach? Who is responsible for capping the team? I am. So the catastrophic result can be shared with the whole group, and my players will tell you that ... but the choice, who decided the tactical line-up, the way to play, I did, so the results and the person responsible is me. The full video is below. This is obviously a much sadder Vine than the one where a triumphant Luiz traded shirts with a tearful James Rodriguez of Colombia after Brazil ousted them in the quarterfinal. Sorry. If you're wondering whether I will stop at nothing to disseminate that Vine far and wide whenever it is even mildly relevant, you are probably onto something. After the game, Luiz got a tearful hug from sidelined player Thiago Silva, who was suspended after receiving two yellow cards in previous games.